By MadJik, March 1, 2018 in Plugins - Publishing ONLY! More and more color palettes are over time in the user folder and finding the right one can be difficult. 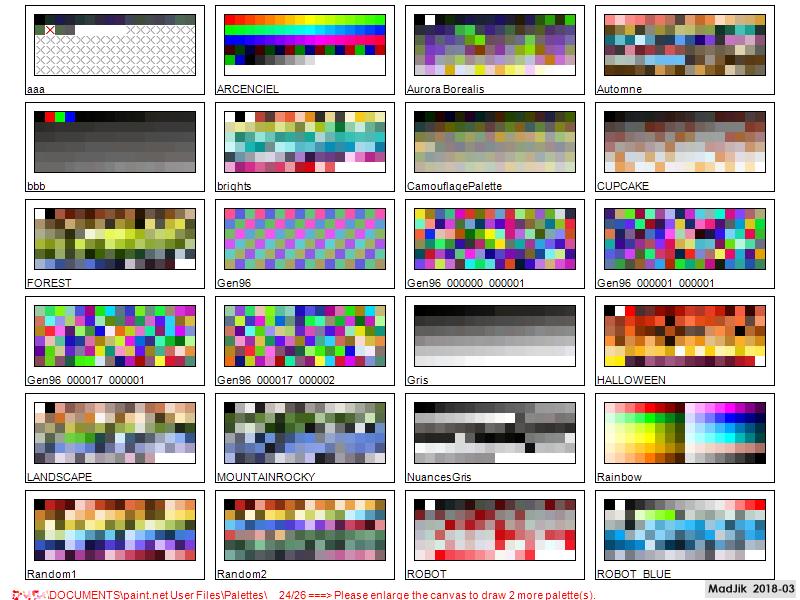 This tool is made to display all the palettes on the canvas. It looks for the files in the palette folder (and subfolders), reads the list of colors to draw a palette for each file. Empty colors are marked with X. Invalid colors are marked with a red X.
NB: All errors (empty or invalid) are removed on all palettes when you save one palette with paint.net. 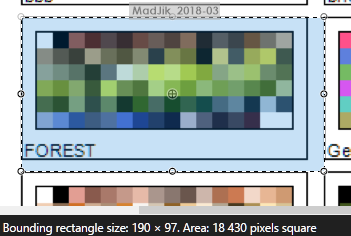 One image of palette uses by default a rectangle of 180 x 90 + margins 10 and 7. Palettes are placed regularly on the canvas. This effect replaces the canvas on the active layer. Be sure to use a new layer or a new image. Set the dimensions large enough to have all your palettes at once on the same image. Then run the effect and choose the colors for the text and the background. If some palettes aren’t shown, you could adjust the size (-/+ 5 pixels of the single color square) with the first slider. This plugin is added to the menu Effects, submenu Tools. This slider allows small adjustments on size of the smallest unit used: single color square. The other elements are based on this size. This is a tool and not a toy ?. If the adjustment isn’t enough you should consider to use another size of image. 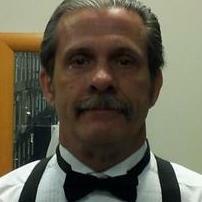 Select the color for the borders and the texts. Select the color for the background of the list of palettes. Background is visible behind empty or invalid colors but isn’t for colors with transparency. 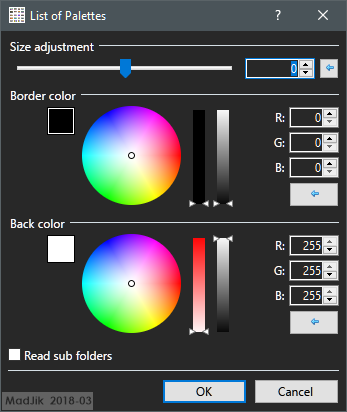 If any sub folders (or tree) exist in the user folder, check the box when you want to see the palettes of the sub folders. A message on the bottom line shows the full path of the folder and the number of palettes shown / the total number of palettes. The message is red if there are too many palettes for the size of the canvas. A very useful plugin. I didn't know how much I needed this before you thought and implemented it, MadJik! I only keep in the normal "Palettes" folder the two or three palettes I use most often. I have another folder where I keep all palettes that I use occasionally to rarely. So, you can see how useful it would be for me to identify and choose a palette I need if your plugin allowed the user to define the path for the palettes to be drawn. If it's too much trouble, please forget I asked; your plugin is very useful as it is. Very nice @MadJik I could see this coming in handy! Thank you! @MadJik! Thank you very much for your effort and plugin. define the path for the palettes to be drawn. @Djisves @lynxster4 @Seerose Thank you for your interest. Have you ever tried to sort a palette? Can it be done programmatically? I use excel but it still doesn't get all the colors grouped together 100%. @AndrewDavid to tell the truth I'm about to release an other one tool for palettes + a new effect using palettes. 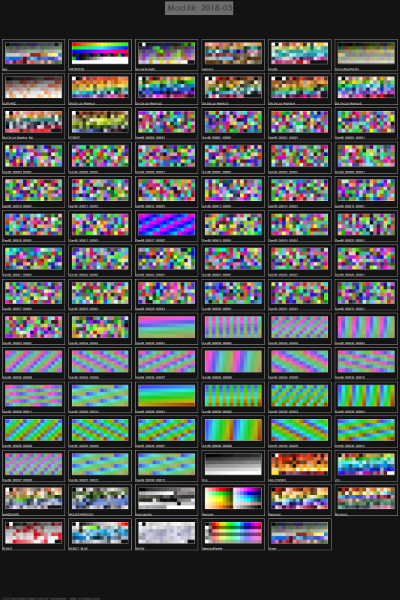 I think, if you are trying to sort colors programatically, you'd want to convert them to HSV first and sort by H (with guard band) then order by S and V combined in some way.